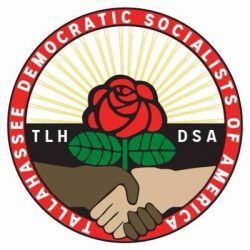 TLH DSA started as an Organizing Committee in spring of 2017 and was certified as an official chapter a few months later. We now have 80+ members and meet regularly. “Promising indeed,” Eugene Debs wrote in September 1900, “is the outlook for Socialism in the United States. The very contemplation of the prospect is a wellspring of inspiration.” Debs, a gifted and militant leader of America’s railroad workers, seemed to have been granted a prophetic gift. When he ran for President in 1900 as the candidate of the newly unified socialist movement, he attracted a mere one hundred thousand votes. As the Socialist Party’s standard-bearer twelve years later, he won nearly a million votes, some 6 percent of the total. In some states, such as Oklahoma, Washington, and California, the Socialist share of the vote climbed into the double digits. Over the same twelve-year period, the Socialist Party expanded its membership from 10,000 to nearly 120,000. Twelve hundred of these Socialists were elected to public office across the United States, including mayors from Flint, Butte, and Berkeley. Socialists were influential in the leadership of some major American Federation of Labor (AFL) unions, as well as in independent unions such as the Amalgamated Clothing Workers. Socialist and non-Socialist radicals in the Industrial Workers of the World (IWW) pioneered in the organization of unions among immigrant workers in mass production industries in cities like Lawrence and Patterson, and among migrant workers in the lumber camps and mining towns of the far west. While the Socialist Party was not immune to the racism endemic in turn of-the-century America, Socialists were among the founders of the National Association for the Advancement of Colored People (NAACP). The ideas of the Socialist movement attracted a growing following on college campuses, in church groups, and in the settlement house and women’s movements. The key to the Socialist Party’s success in the 1910s was unity in diversity. Its members disagreed with each other on some issues (whether, for example, to put their main emphasis on electoral or union organizing), but for a while the common goal of democratic socialism seemed more important than tactical or ideological differences. In the long run, Debs’s optimism proved misplaced. The year 1912 was the high-water mark of Socialist strength. The party fell on hard times with the coming of the First World War. Pre-existing internal tensions were exacerbated by debates over the party’s attitude towards American involvement in the war, followed by debates over whether (or how best) to support the Russian Revolution. Official repression of antiwar dissent led to the imprisonment of Debs and dozens of other Socialist leaders, while Socialist legislators were expelled from public office and the Socialist press was banned from the mails. As a Communist Party on the Russian model split from the Socialist Party, and the IWW went into a sharp decline, the radical movement in general slipped into the doldrums in the 1920s. With the onset of the Great Depression in 1929, however, faith in American capitalism went into a tail-spin, and the fortunes of the radical movement revived. Despite the deep divisions that beset the left, radicals from a number of different groups — Socialists, Communists, and Trotskyists among them — played a central role in the struggles of the unemployed to win adequate relief in the early 1930s, and in the vast expansion of industrial unionism through the organization of the new Congress of Industrial Organization (CIO) in the later 1930s. Socialists helped to organize Detroit autoworkers and southern sharecroppers; Communists were influential in drives to organize the auto, steel, electrical, and longshore industries, among others. While neither Socialists nor Communists were able to replicate the electoral successes of the Debsian era, the Socialists were able to attract a million votes for Norman Thomas, their Presidential candidate in 1932. Running in the Democratic primary, the Socialist novelist Upton Sinclair captured the Democratic gubernatorial nomination in California in 1934. And during the “Popular Front” era of the later 1930s, when Communists sought to build a broad-based American movement not so explicitly tied to the Soviet model, the Communists developed a considerable political base and measure of influence within the Democratic Party in such states as Washington, Minnesota, and California, and in the American Labor Party in New York. The Thirties did not usher in “the Revolution,” contrary to the expectations of many at the start of the decade. Nevertheless, much had changed for the better in American politics in the space of a few years. While Franklin Roosevelt’s administration was never the hotbed of radicalism it was portrayed as in right-wing propaganda, it is certainly true that radicals helped play midwife at the birth of the liberal-labor “New Deal coalition” that would shape the contours of Democratic Party politics over the next three decades. Radicals were not, however, in a position to take independent advantage of the new political possibilities opening before them. The Socialist Party finished the decade once again in disarray, wounded by an internal factional battle with Trotskyists (with whom they shared little beyond a hatred of Stalinism), and divided over the question of whether they should abandon their long-standing refusal to back Democratic Party candidates. The Communist Party, though nominally more “revolutionary” than the Socialists, had proven tactically more flexible, and its tacit alliance with Roosevelt had helped it to grow to perhaps as many as 75,000 members by 1938 (with another 20,000 in the Young Communist League). After a bruising few years when its international guide, Stalin, was allied with Hitler, the American Communist Party seemed to emerge triumphant during the years of the “Grand Alliance,” when the United States and the Soviet Union were allied against fascism and it was possible to be both “patriotic” and “pro-Soviet.” But with the onset of the Cold War in 1945, radicalism of any sort was again suspect, and the Communists came under particularly ferocious attack. By the mid-1950s, dozens of Communist Party leaders had been imprisoned under the Smith Act, while thousands of rank and file Communists were harassed by the FBI, dragged before Congressional investigating committees, denied passports, and in many instances fired from their jobs. Several of the most unscrupulous men in postwar American political life, including Joseph McCarthy and Richard Nixon, built their careers on the shrewd manipulation of anticommunist hysteria. In the end, the Communist Party was able to survive McCarthyism. What finally led to its demise as the most important force on the left was its own internal disagreements, brought to a head in 1956 by Soviet leader Nikita Khrushchev’s denunciation of his now safely-dead predecessor Stalin. This “de-Stalinization crisis” led many American Communists to question not only their previous unquestioning support of Soviet policies, but also the undemocratic nature of Soviet-style socialism and the authoritarian nature of their own movement. Most of these dissenters left the party after 1956. Even as the Communist Party disintegrated in the mid-1950s, a new wave of radical activism began to take shape. This time, however, it would not be the traditional socialist parties of the left that would lead the way, nor would the organization of the industrial working class be the main concern of the new radicals. Starting with the Montgomery bus boycott of 1955-56, led by Dr. Martin Luther King, Jr., and accelerating with the sit-in movement launched by black students in Greensboro and a dozen other southern cities in 1960, movements emerged that were destined to change the U.S. political landscape. White students, inspired by the example of their black counterparts in the Student Non-Violent Coordinating Committee (SNCC), were drawn into civil rights protests, and from there into a wide range of movements for peace, university reform, and social change. Many joined a new campus group, Students for a Democratic Society (SDS), which became the main organizational vehicle for what was beginning to be called the “new left”. A series of developments in mid-decade — including John F. Kennedy’s assassination, the murder of civil rights activists in the South, and the mounting escalation of the Vietnam war — spurred the growth of the new left, while tarnishing the optimism of the early 1960s. Over the years in which the war in Vietnam raged on, a loose coalition of radical activists developed the broadest and most diverse antiwar movement in American history. It was, to be sure, a turbulent and in many ways a tragic era. Some student protesters, in despair over bringing the war to an end (and sometimes egged on by government agents), turned to selfdefeating violent street confrontations and even to bombings. But it should also be remembered that, by the end of the 1960s, antiwar sentiment had spread from elite Ivy League universities to working-class community colleges and high schools, and that groups like the Vietnam Veterans Against the War were playing an increasingly prominent role in antiwar demonstrations. The general cultural and political ferment of the decade also gave rise to a revived feminist movement and a new gay liberation movement. At the end of the 1960s the left again faltered. If the old left Socialists and Communists had been too wedded to the “New Deal coalition” of urban ethnics and industrial workers to respond adequately to the new black, youth, and women’s insurgencies, nevertheless those new constituencies alone could not build a stable base for a mass new left. Martin Luther King’s assassination in 1968 hastened the demise of the civil rights movement, while SNCC and SDS collapsed from sectarian excesses. The antiwar movement held on into the early 1970s but, by the signing of the Paris Peace Accords in 1973, had lost most of its momentum. And not only was the left collapsing, but this time the New Deal coalition itself — the mass base for American liberalism — was showing signs of increasing instability, as Richard Nixon’s victories in 1968 and 1972 indicated. This liberal weakness became progressively clearer as Nixon’s fall in the Watergate scandal led, not to a revival of the New Deal coalition, but to a long-term revival of radical conservatism in the Republican Party under Ronald Reagan. From the beginning of this long period of deepening conservatism in the early 1970s, several groups continued to uphold the traditions of the American left. Two in particular sought to recreate the broad and tolerant spirit of the Debsian Socialist Party, while absorbing also the new lessons, causes, and constituencies over which the left had stumbled in the intervening decades. The Democratic Socialist Organizing Committee (DSOC) had been founded by Michael Harrington out of some fragments of the old Socialist Party. DSOC continued to operate, in the old Socialist or Communist manner, as the left-wing of the New Deal coalition, clearly now not as a separate political party but as an explicitly socialist force within the Democratic Party and the labor movement. It met with some success in attracting young activists disenchanted with the Democratic Party’s drift and seeking ways to galvanize the ailing party coalition. DSOC also drew to its banner a number of well-known public figures, such as Machinists’ Union leader William Winpisinger, feminist Gloria Steinem, gay rights activist Harry Britt, actor Ed Asner, and California Congressman Ron Dellums, the first avowed socialist in Congress since World War Two. The New American Movement (NAM) emerged at about the same time, more from the new left than from the old, though it counted in its number some former Communists who had left their party after 1956. NAM, true to these new left origins, was more skeptical about the long-term future of the New Deal coalition, and accordingly devoted its energies more than did DSOC to the new movements of the 1960s, especially feminism, gay and lesbian liberation, and local community organizing. But neither NAM nor DSOC saw their heritages and organizing areas as mutually exclusive, and by the early 1980s — especially considering the weakness of the American left — came to see themselves as complementary, completing a formal merger in 1983. The merged organization, Democratic Socialists of America (DSA), for the first time since the First World War brought together the various splinters of left opinion in America: former Socialists and Communists, former old leftists and new leftists, and many who had never been leftists at all. The decades of disunion had taken their toll. The hundreds of thousands of Debs’s day had dwindled to mere thousands. But a new beginning now seems possible in the 1990s As the old Cold War polarities break down, DSA has an opportunity to demonstrate that the history of the American left had reached a turning-point, not an end. Maurice Isserman teaches history at Hamilton College. A DSA member, he is author of several books, including If I Had a Hammer: The Death of the Old Left and Birth of the New; Dorothy Healey Remembers: A Life in the American Communist Party; and The Other American: The Life of Michael Harrington.